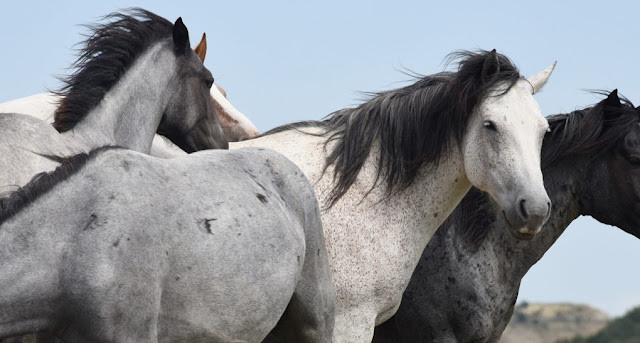 Last Friday, the Bureau of Land Management‘s (BLM) National Wild Horse and Burro Advisory Board made the decision to use euthanasia to kill 45,000 wild horses currently captive in government holding facilities throughout the US. The decision has come under great scrutiny by organizations who argue for using birth control to minimize population growth, instead. Over the last 20 years, the BLM has been rounding up and removing wild horses from their natural habitat in the interest of allowing privately owned cattle to graze on the land. What they have experienced since then is the unsustainable financial burden of keeping the horses alive in their facilities – $49 million in 2015, alone – and the task of coming up with an alternative solution. The vote to euthanize the horses held in long-term holding comes on the heel of BLM announcing their plans to experiment on mare spaying were canceled due to public outcry and multiple lawsuits being filed. With public outcry at every turn, and the wants of the cattle industry for less competition for forage, the BLM finds itself struggling to make decisions and stick with them. Responses to "The US government votes to slaughter 45000 wild horses"
ARE THESE NOT PUBLIC LANDS??? ARE THESE NOT PUBLIC HORSES? THIS WAS THE PLAN ALL ALONG...WAS THERE A PUBLIC VOTE??? ON THIS DECISION?? In other parts of the world, they would solve it by eating the horses! Horsemeat is popular in various European countries and is a sustainable way of keeping the size of wild herds under control. And to reduce the number of unwanted horses, as many people in Europe buy horses, not realizing that they can live 20 years and more. Find buyers overseas and export them. So there can be more beef to eat (rounding up and removing wild horses from their natural habitat in the interest of allowing privately owned cattle to graze on the land) - another farce since the cattle will be fed grain to fatten them up (that's what make beef full of unhealthy cholesterol), or more leather for clothing, or whatever, wild, intelligent, living creatures (mustangs) are kept in captivity, on public land, and will now be murdered because it costs too much. Let them return to the land, tell the greedy beef owners to be less greedy, and butcher the cows. Humans needs to stop mucking up Mother Nature. We cannot allow this. Better management techniques are demanded. If BLM and those that voted in favor of this travesty continues with this I can guarantee they will lose more than their corrupt company. We are here to protect those animals and God made them. When he turns his back on them and he will... then they will know that the hardships they face will be of a direct consequence. So it shall be in Jesus name. For every horse sent to this deathsentence will equal one day the BLMs servers and websites will be down. We do not forgive....We do not forget. We are the ghosts you created....We are final boss of the internet. We are all and we are none. Where you have your alphabets in government...We have an army. WE ARE LEGION. We are the resistance. Im totaly agianst this killing of That many horses.WE all know wht BLM will do!there turn around and sell the meat to England or one of the europing countrys for profit to there pockets.This is a known FACT! !.So Im saying,HELL NO TO THE KILLING OF THE HORSES!!!. stop killing horses. you took them from where they lived and imprisoned them and now you want to kill them. you complain about what it costs to feed them! If you had left them alone it wouldn't have cost anything, it's their land! let people use them for riding, as a work horse on farms or any number of things. try killing all the assholes trying to kill ưs and leave the horses alone! This is insane & just sickening! They have no right to do this. Should of left them where they were. Spend yr energy on protecting this country instead of profiting off of killing all wildlife. We have wild horses here in the Ozarks of MO and we formed a group when they started doing the same thing to them Our group stopped them but we also agreed to keep a watch on them and a general count of them if the different herds got too big we have wild horse auctions to thin the horses down . Also if there are sick or injured ones the club weeds them out and has them checked out by vets and auctioned to private owners. As a citizen of theses United States, I respectfully call on President Obama, the U.S. Congress and the U.S. Department of the Interior to support the Bureau of Land Management in developing a long term vision and plan for the humane preservation of America's wild horses and burros. We call on our leadership to dismiss the National Wild Horse and Burro Advisory Board’s recommendation that the Bureau of Land Management use euthanasia to reduce the number of wild horses and burros in its holding facilities and seek to actively implement minimally invasive humane alternatives to manage wild horses and burros on the range and in captivity. The American people have invested hundreds of millions of dollars for the protection, care and feeding of these animals, and they have voiced loudly and repeatedly their wish for wild horses and burros to remain free on the range. BLM should instead make the strong case for on-range management, including the use of safe, effective and humane fertility control vaccines, as well as pursuing partnerships with nonprofits, individuals and ranchers, providing incentives to ranchers willing to reduce or forgo grazing privileges on public lands as we all work together to restore balance on America's western rangelands. Is there no other way to use the horses? Cull them from the main herd and sell them off on auction to farmers who need horses? Must they be slaughtered before an option is put forward? Why is it that all you want to do is DESTROY? You are not the creator so why do you feel you have the right to take LIFE?! Disgusting and not thankful for your own life. Why, why, why? Did all animal lovers that responded to your original ideas to round up these 45000 wild, did they suspect this would be the outcome? NO!! At that time, even after a few deaths of horses ran to death by helicopters, we hoped you would answer the way you had promised. You said you would keep and feed these wild ones and offer them for adoption or other good home,!! I guarantee you did not follow through with this! STOP taking money from the greedy ranchers, and release the horses back to their homelands. The ranchers need to keep cattle concurrent with their owned lands. Return these horses to the wild. Do the right thing for a change!!! All God's creatures Great and Small! What right do you have to destroy them all? Children and animals need protection from harm, in all forms and from all destructive forces. Save the horses! And no, I didn't rhyme on purpose. It just came out that way!